The closer it is to the bottom of the funnel the more priority it gets. Since I already have my methods of driving traffic in place, only a couple of them (paid blog posts and non-paid guest posts) appear in my funnel. I can create a similar funnel later for ways to drive traffic. Making sure I published all my posts/pages for services that I offer was step one for me. See Why Your Blog Should Have a Hire Me page because one of the most consistent methods a blogger can use to earn money is offering skills they already have as services. The next step is completing a free ebook to offer as an incentive for subscribing to this blog. This is my new priority – one that has taken a long time because it involves several other people. Rotating ad spaces refers to a method of monetizing a blog that displays rotating ads (either paid ads or affiliate banners). My plan is to rotate 300×250 ads where the box in my right sidebar currently shows an ad for List Building for Bloggers. I have already selected many ads that should appeal to my readers because they are related to social media for bloggers and small businesses. I have asked my WordPress Ninja Derek Semmler to add another ad box above the header for 728×90 affiliate banner rotation. I have selected ads for that rotation too and obtained the XHTML versions he recommended. These two sizes and positions are the most commonly used monetization methods on sites like Technorati and should give GrowMap a more professional look. Paid Blog Posts refers to my writing posts for blogs that are willing to pay for my expertise, but it could also include paid Blog Outreach work. Non-paid guest posts are the method I will be using to attract more small business readers. By choosing blogs that already have primarily small businesses reading them I can raise my visibility in that niche. As I mentor others on Twitter Best Practices, Blogging Collaborations and Small Business Internet Marketing I document what works and what questions others ask and will take that experience and those case studies and notes and turn them into ebooks I will offer for sale as comprehensive manuals small businesses and bloggers can use. Was any of this helpful to you creating your own priorities funnel? Would you like me to create a driving traffic priorities funnel and publish it? I find this really useful and it would be better if you will write a funnel regarding site traffic. Giving out free e-book builds your reputation online so you really have to make sure that you’re giving out good information that would keep the readers come back. Nice post! I would be interested in a driving traffic funnel. I haven’t made my own funnel graph. I am a very organised person so I already have it in my head and do it step by step. But when I feel like it’s all too overwhelming and I might forget some great ideas in the storm/chaos then I write down my steps. I’ve heard of paid blog posts, but this is generally through networks and others are paying for a post on your site for a link and some exposure generally. Did these sorts of offers just naturally come after you positioned yourself as an expert and you adapted by also offering it on your hire me page or did it start with your hire me page? Great post! Interesting idea about the GrowMap Sales Funnel. Making list of priorities are very important in internet marketing business. I also love the idea of free e-books! Thanks for sharing! I’ve been experiencing ups and down in driving traffic for my site and I believe this traffic funnel will be a great help for me. I’m looking forward to check this out. Excellent! This is exactly what I need right now. I’ll check out Kim’s post right after this. I think it’s important to note that your marketing funnel is distinct from your priority funnel. The priority funnel is a stroke of genius because those with many tasks ahead of them to get their blog (or business) fully functional can easily simplify the steps to completion using this model. An effective marketing funnel has ever increasing levels of commitment (financial or otherwise) from prospects/leads/customers. Front end offers followed by upsells leading to highest ticket backend and continuity programs and so forth are mapped out in sequence. I appreciate you sharing this insight into how you’re thinking Gail, and this very useful model. Thanks! If you’re giving a free ebook just make sure that’s is good, concise and with really valuable information. I’m tired of all those sites who are giving away eoboks just to get my email…if you give valuable info to your readers and they like you, they will be willing to buy anything from you. That’s a perfect sales funnel, brilliant people always come up with something different from the rest. With that kind of strategies at hand work will get more interesting and trying one at a time I guess is the key to achieving those goals. Prioritizing is very important, we cannot execute our tasks as we wanted if we do not prioritize things from the start. Interesting Idea about the GrowMap Sales Funnel. Making priorities are very important in business, specially in blogging. Thanks for sharing! For me it is more on setting your goals. That goal will serve as your accelerating point to work hard and smart and be successful. Making a funnel like you have made to visualize what you are going to do next seems to be a great method of sorting down the main priorities. I am eagerly looking forward to seeing your traffic funnel and if possible try to make my own funnel for my blogging priorities. Hi there.Nice post.I liked your innovative idea of the grow map funnel.It is one of the best ways of prioritizing things.Giving free e-books is a very nice idea. You – graphics challenged?! That’s the best manualy drawn sales funnel i’ve ever seen. …it’s drawn by hand, right? Just kidding, i noticed your above response about the image. What’s important is the information, not the way you draw, anyway. The growmap sales funnel seems interesting and new to me. I haven’t tried anything from the sales funnel, including free e-book, rotating ads, etc. Maybe I should try the hire me pages so that I could be able to offer my services too. Most bloggers have skills they can offer so that is a good place to start. It has taken me years to find out what the best size and position for ads is and that rotating multiple ads is generally more effective than static ads. I’ve known about ebooks for a long time but making that happen is almost as complex as getting a free ebook as an incentive to join a mailing list done. I have a greater respect for the bloggers who think all that is easy. It isn’t easy for the rest of us! Your How to Make Money on the Internet Infographic is very interesting. If you register for CommentLuv you could share a link each time you comment. I usually download e-books but I haven’t tried making e-books. I already got commentluv so thanks for suggesting it. Thats really cool. I’d be interested in seeing the driving traffic funnel. I definitely need to work on my own priorities. That seems to be a popular request. I’ll work on one for next week. Driving traffic is actually the easy part for me. I would like to see the driving traffic funnel. I would also like to see the sales funnel with all the stuff you do, even the stuff already done, so I get a complete picture of what is going on. Leaving out the stuff that is completed means I leave out those steps without ever knowing they exist. I did not leave any monetization steps off this funnel – only traffic steps. I will work on a traffic driving funnel for next week. Thanks for putting Kim’s post into something visual and easy to read. I think you could easily have turned it into an ebook already. Looking forward to the traffic funnel. I lucked out and found a funnel image that didn’t have any text on it which allowed me to create this one. I’ll work on a traffic funnel for next week. Is PPT Pro a PowerPoint search engine? Why yes! My friend who runs it made me the “PR” spokesperson. Check it out if you are ever searching for ppt files. 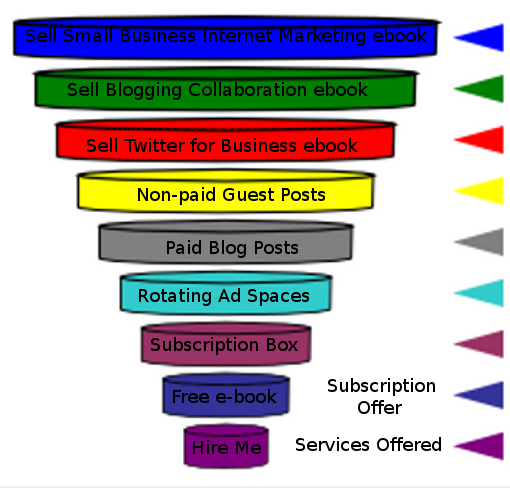 To draw an funnel is really result of good marketing.Free ebook is an incentive that always makes the readers to visit the blog time and again.